On the 21st of January, a small group of respected geeky journalists met up at the Microsoft visiting center in Redmond, Washington. They would soon be among the first to experience the Augmented Reality Microsoft has in store for us. Everyone expected the press event to be about Windows 10 and how it would change all of Microsoft’s other major products. Nobody thought that Microsoft would reveal a new device; a device with the potential to revolutionize technology as we know it. This device is called the Hololens and it has been in secret development for 7 years. 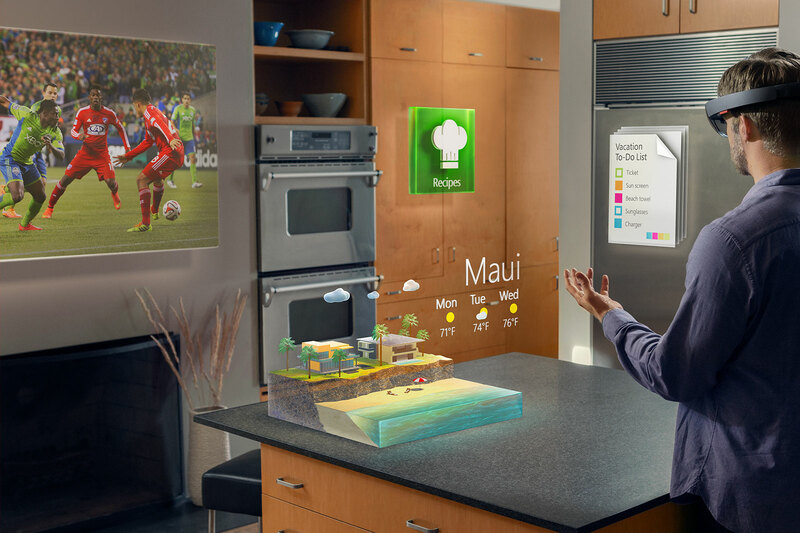 The Microsoft Hololens is an augmented reality-computing device. The device resembles ski goggles, with a big dark visor, and a dark band. The screen creates images that convince the wearer that all kinds of things are appearing in front of him. Like a computer, the Hololens can run several different applications. In fact it is a computer, and completely self-contained as well; it is not a kind of Bluetooth device. However, it has the potential to do so much more. The Hololens tricks your brain into thinking that a virtual world is appearing in front of you, but synced with your real surroundings. Sound simple? Well, it’s not. Microsoft’s developers needed to come up with a whole new way of working with light. They needed to “literally smack up against some of the laws of physics on what we can and cannot do with light,” as a Microsoft Representative put it, in a video featured at the press event. They also developed a whole new semi-processing unit. It’s called the Holographic processing unit (HPU), a semi-processor that processes terabytes of data from multiple advanced sensors and cameras. HPU creates a 3-D model of your surroundings. It also keeps track of your hand movements, gesture and gaze. This allows you to control and interact with your virtual world. Not only that, but you can interact with a real world object, using a virtual object, like a hammer, or axe. Even with just your gaze, you can open Netflix, or play Minecraft. That is one of the biggest features of the Hololens. Your “virtual world blends in with your real world.” You can build a house on your living room floor, or blow up the wall in your dining room with TNT, or destroy the toilet in the bathroom with a pickaxe. Instead of getting a TV, just open up the TV application on the Hololens, and make the TV whatever size or shape you want. This TV can be placed anywhere. Talk with your cousin in Egypt while walking to work, with no need to hold onto a device; just look up at the rectangle in mid-air with your cousin’s smiling face in it. Walk on the surface of Mars, or visit a simulation of the house you want to buy. You can do all these things because the Hololens makes it seem like they are actually happening. Imagine the advantages that the Hololens could bring to the classroom, where everything can be transformed into a whiteboard, and you can clean up with the touch of an invisible button, draw in mid-air, make virtual apples appear to teach math, and so much more. So where did the Hololens come from? It just seemed to pop out of the blue. The Hololens platform was first pitched for a similar project, the platform that would become the Xbox Kinect. It was worked on for seven years in complete secrecy, which is a shocker as Microsoft is notorious for being a horrible keeper of secrets. The Hololens was developed in the Microsoft visiting centers basement, right under the spot where its existence was first revealed. There’s no doubt that the Hololens has a lot of potential, but right now all we can do is wait. Microsoft will fill us in on April 29th, when its Build developer’s conference begins. However, after the conference, the wait will not be long, as the Hololens is expected to come out this year, most likely over the summer. Previous Post Brian Williams: Forgive and Forget?